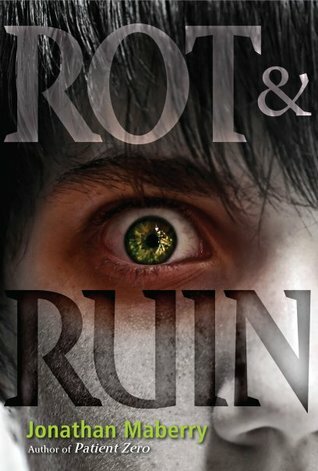 If you’re one of those people that have still not read any zombie books because “they are just not your thing” well get of your high horse and read Rot and Ruin anyway because it’s not about the zombies it’s about a boy and what he has to go through to grow up. Yes! There are zombies in Rot and Ruin and all they want to do is eat your living flesh (insert thriller music). But, for the most part this is a story of awesome characters and I loved reading about their lives. Even after hearing great things about Rot and Ruin I had no idea I would love it this much! Benny Imura is just an average teenager who happens to be growing up after the world has been changed by the zombie apocalypse. This world that Benny knows is nothing like the one we live in. There is no electricity, and the entire town is fenced and guarded due to the zombies that still roam the outside world which is called the Rot and Ruin. Even though they live in this crazy post-apocalyptic world I liked that Benny and his friends were still worrying about normal teenage things like getting their first job, or whether a friendship could turn into more than that. All this changes when Benny ends up taking a job with his brother. Benny thinks he knows what he’s in for but he has no idea. Tom Imura, Benny’s brother has looked after Benny since their parents died on first night. (First night is the night the zombie virus broke out.) Tom is nothing like the other Zombie hunters that Benny idolizes, Benny has really always thought his brother was a coward. I loved how Jonathan Maberry takes you to Benny’s very first memory to let you know why he hates Tom so much in the beginning. (No I’m not telling what the memory was.) Then as Tom and Benny have to spend more time together you see walls slowly breaking down between them. Nothing was rushed which was so nice to enjoy watching things unfold little by little between the brothers, even if it was more intense. It was better for it. Jonathan Maberry, thank you so much for this book! I. Loved. Rot and Ruin. I can honestly say I never would have imagined that a YA book that I was told was about zombies would have me go through pretty much every emotion. But Rot and Ruin did. I cried in more than one part of this book. And just for the record I’m not a big crier! I want my own pack of zombie cards. Umm not that I want real zombies to go along with that. I am so happy that I get to read Dust and Decay soon because it’s already out. I can’t wait to read what Benny, Tom, and everyone else is up to. In short go read Rot and Ruin—it is made of awesome! I can't wait to get to this book! @RichardYou need to stop whatever you're reading now and read Rot and Ruin! Thanks for the great review! So glad you enjoyed ROT & RUIN. I LOVED this book! Thank you for the great review. I am listenig for Dust and Decay now and loving it so far. I love anything zombie :-) Glad you liked the book! Great review! I read Dead of Night by Jonathan Maberry this weekend all in one sitting and I've never read a better zombie book EVER. I have Rot & Ruin on my shelf but I haven't read it yet. I need to, like, yesterday. Also, how awesome is that shiny eye on the cover? HELLO. @jonathanmaberryThanks for the links! 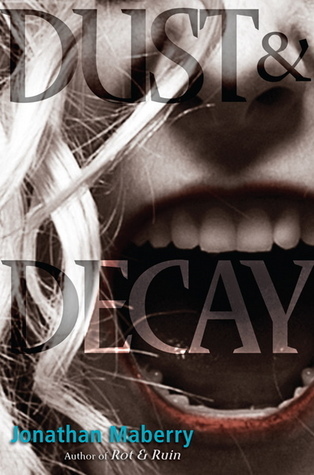 I went to the bookstore today to get Dust and Decay but they were out:( So I will have to order it. @SweetestLittleBookwormI have heard awesome things about dead of night can't wait to get my hands on it! I will be looking for your review. @LizaI am having such a hard time not going and looking at reviews for spoilers. But, I want to be surprised!